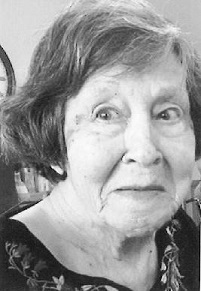 Lucille Little Blankenship Gowin, 89, of Abilene, passed away on July 14, 2015 in San Angelo, Texas. Graveside services will be held Saturday, July 18th at 10:00 am in Bradshaw Cemetery with Reverend Jack Stevens officiating. Arrangements are with Robert Massie Funeral Home. Visitation with family will be at her residence after the service. Lucille was born in Bradshaw, Texas to Ruby and Emmett Lee Little on February 14, 1926. She went to school at Bradshaw. She married Gerald Jackson Blankenship in 1944. She married Samuel C. Gowin in 1971. She graduated from Gail Business College in Abilene, Texas. She worked as Director of Sears Community Action Program for 5 years. She was also employed by K-mart. Lucille is preceded in death by parents, Ruby Bagwell Little and Emmett Lee Little; sisters, Imogene Thompson and Lois Woolsey; spouses, Jack Blankenship and Sam Gowin, cousin- J.B. Little and great grandson Cody Elder. Lucille is survived by her children-Vicki Blankenship, Rocky Blankenship and wife Indire Hajredini, Nancy Blankenship Baxter, Ruby and Gary Wilson, Sandra Blankenship, and Susan Blankenship, Brothers, Leroy Little and James Little; Grandchildren, Michele Campbell, John and Jean Stanfield, Amanda and Thad Garlinghouse, Jason and Ashley Myers, Randall and Kelle Wilson, Scott Wilson and Kaylee Blankenship White; Great-Grandchildren- Chance Murphy, Joe Murphy, Cheyenne Bryant, Heather Campbell, Max Wilson, Chloe Hansen. She treasured her cousin Melba Little, and niece Anita Evans. Memorials may be given to; American Heart Association. The family of Lucille wishes to extend our sincere thanks to Dr. D'Arcie Chitwood, the entire staff of Meadow Creek Nursing Center. We appreciate especially the loving care during her final hours provided by Lady Jane Motley, Robin Gross, Samantha Serrano, Guadalupe Galindo, and Alexandra Rico and for the support of Crystal Muniz and Sherry Owen. We would also like to thank the staff of Gentiva Hospice Care, especially Robbie Brewer RN. Lucille was a wonderful mother, a great provider, and will be missed by all. Lucille's obituary and guest book may be viewed online www.robertmassie.com.